U.S. equity markets ended mixed on Friday, as disappointing earnings from technology and internet companies drove the NASDAQ 100 Index to its largest weekly decline since February 5th. While earnings for S&P 500 companies are so far surpassing analysts' consensus forecasts by an average of 4%, first quarter results from many mega-cap tech stocks have weighed negatively on the broader market. The NASDAQ 100 Index, representing performance of the 100 largest non-financial and international stocks listed on NASDAQ, fell 1.51% last week. In other key economic data last week, homebuilders broke ground on fewer new homes in March, dropping to the lowest level since October, while building permits fell to fewest in a year. Spring home sales quickened, reaffirming market strength, with existing home sales topping economists' projections in March. Over the past year, used single-family home sales are up 2.6%, while multi-family units are down 6.6%. For the week, the S&P 500 gained +0.53%, the Dow Industrials rose +0.59% and finished the week above the 18,000 level for the first time this year, while the MSCI EAFE (developed international) increased +1.3%. Oil prices dipped at the start of the week due to the failure to agree on an output freeze in Doha, Qatar on Sunday, April 17th. However, prices quickly rebounded and have continued to surge to their highest level this year (see Chart 1 above). This rebound was partly due to a short labor strike in Kuwait, which temporarily cut oil production by about 2 million barrels/day, but also an improvement in sentiment towards commodities in general. 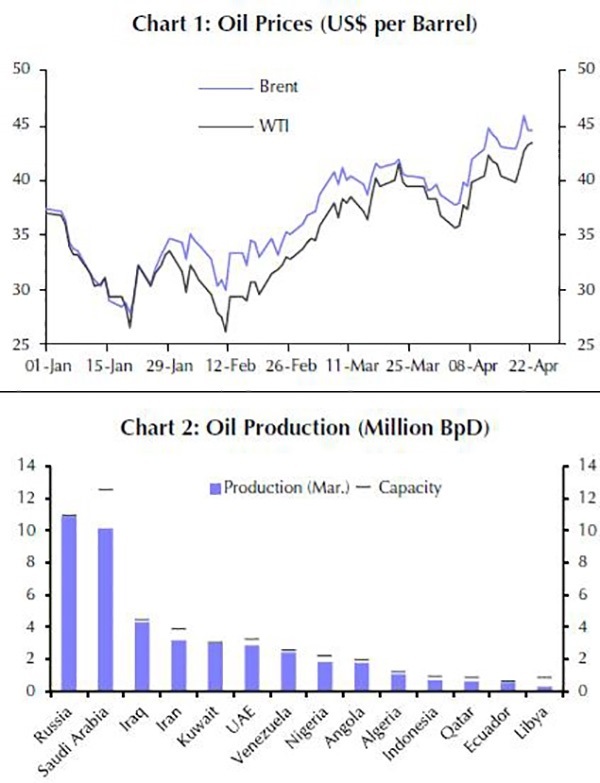 Comments from Saudi Arabia, made prior to the failure of the Doha meeting, that the country could ramp up its oil production were probably political grandstanding rather than a legitimate threat to flood the market, even though the country has more than enough spare capacity (see Chart 2, the line above the blue production level). The recovery in oil prices has now taken Brent Oil above Capital Economics' 2016 year-end forecast of $45 per barrel. Therefore, it would not be surprising to see the rally pause for breath soon, but remains comfortable with their view that prices will recover further - to around $60 per barrel - by the end of 2017. Furthermore, the recovery is consistent with the big picture of constrained supply, recovering demand and improving sentiment that is expected to lift many commodity prices over the coming years. This is good news for equities, especially in emerging markets (EMs), but also carries risks for bond investors and US dollar bears. So far, U.S. inflation expectations have remained relatively subdued, but this may not last as oil continues to trend higher, creating a less dovish assessment for Fed interest rates, and thus vulnerability for the bond markets, especially Treasuries. However, this reassessment could also put renewed upward pressure on the US dollar against other major currencies, which is one potential catalyst for a temporary correction in commodity prices.